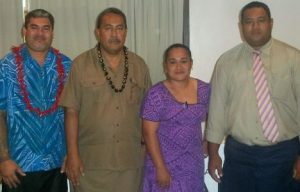 Samoa Football > News > 2011 FFS Ordinary Congress. > Toetu Petana elected FFS President. Toetu Petana elected FFS President. with the election of Toetu Petana as President of the Football Federation Samoa (FFS) for the next 4 years. Mr Petana was elected at the 2011 FFS Ordinary Congress, held at the Oretors Hotel. Executive Committee: Faumuina Michael Kapisi, Palota Asiata and Emily Young. The day kicked off with the Honourable Prime Minister of Samoa Tuilaepa Lupesoliai Sailele Malielegaoi officially opening the congress. New Zealand Football Chairman Frank Van Hattum than thanked the Normalization Committee and FFS staff for all the good work done over the last two years in establishing credibility again to football in Samoa. The elective congress also saw the Normalization period for Football in Samoa come to an end. The responsibility of governing football in Samoa now rests again which the FFS President and Executive Committee. (More Details from the 2011 FFS Elective Congress to follow). Next Post‘Just Play’ – A Huge Success in Savaii. New FFS President – Savae Togia Toetu Petana. ‘Just Play’ – A Huge Success in Savaii.